The following story is contributed by the Natural History Museum of Los Angeles County , one of Natural History magazine’s Museum Partners. Members of any of our partner organizations receive Natural History as a benefit of their museum membership. The Natural History Museum of Los Angeles County , which opened its doors to the public in 1913, is the largest natural and historical museum in the western United States, safeguarding more than 33 million diverse specimens and artifacts. Its main exhibition halls, located at 900 Exposition Boulevard, feature grand dioramas of African and American mammals, rare dinosaurs and fossils, marine animals, Pre-Columbian culture, gems and minerals, and historical artifacts from California and Southwest history, as well as early Hollywood memorabilia. The Museum is also an active research center, spanning living and fossil invertebrates, vertebrates, mineralogy, anthropology, and history. The Natural History Museum also includes the William S. Hart Ranch and Museum , once the home of that silent film actor, and the Page Museum at the La Brea Tar Pits . 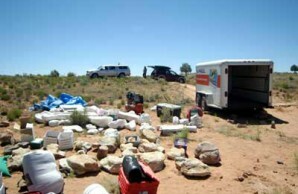 The cache from the 2008 Utah expedition, prior to their transport back to Los Angeles. In the foreground are dinosaur footprint casts; behind them are plaster jackets of the sauropod nicknamed Gnatalie. 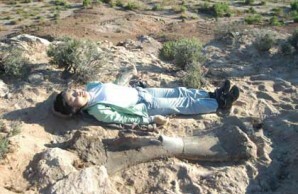 Post-doctoral fellow and 2008 expedition team member Sayaka Kawasaki next to a brachiosaur humerus. This year’s expedition was planned for the spring to avoid gnats, and a core DI staff was joined by colleagues from Spain, Argentina, and New York’s American Museum of Natural History. This is a story about that expedition. After lifting off the plaster caps from last year, excavators went to work on the new sauropod. Luis is particularly interested in the creature’s huge vertebral column for inclusion in the Museum’s new dinosaur hall. This large new sauropod is not the expedition’s only focus, however. A separate arm of the team branched out to excavate one of this year’s new finds—an articulated sauropod tail, found several miles away. On these expeditions, everyone shares the hammer and chisel duty, but there are specialized roles. Doug Goodreau, the Dinosaur Institute Senior Preparator, is the crew chief, managing resources both human and non-human. He figures out who has what skills, how they can be teamed so those skills can be taught and shared, and all the logistics of equipment. Sometimes that means renting jackhammer or an air compressor. Sometimes that means driving into town and hiring a couple of guys to help with some lifting. But there’s another side of Doug: He has a night job as a freelance embalmer, specializing in the reconstruction of severely traumatized human remains at mortuaries throughout L.A. So as the bones are extracted, Doug is also charged with using polymer-based glue to keep them together—strengthening the specimens on site so they can be transported safely. Susan Russak started as an NHM docent in 2004. A few years after that, she began preparing fossils in the NHM paleo lab under the direction of Senior Preparator Doug Goudreau. She has participated in three consecutive field expeditions in Utah. Dinosaur Institute illustrator Stephanie Abramowicz maps the quarries. She runs strings over the dig pits north and south, east and west, from a high point called the datum. That mark that will be there when the team returns next year, and it will guide their resumed excavation. But back at the Museum, the maps will be used when the specimens are curated, articulated, and written about, so that paleontologists will know where the bones were positioned in relation to each other. Without Stephanie’s maps, the bones have no data, no context—they’re just objects. Curatorial Assistant Paige Johnson has organized the expedition, and somehow controlled the flow of colleagues and visitors coming in from all over the world to this remote spot. She manages the budgets; sweating the amount of money the team spends for provisions, for instance, or the right U-Haul rental deal. Aisling Farrell is a former Dino Institute stalwart who’s now a curatorial assistant at the Page Museum at the La Brea Tar Pits, and is here as a consultant. She has been in the field with Luis many times, she knows all the sites, she has an uncanny sense of direction, she loves prospecting and she never tires. Susan Russak became a Natural History Museum docent in 2004, and then one day the NHM Volunteer Coordinator invited her up to the fourth floor paleontology lab. “I walked in, and that was it,” Susan says. This is her third expedition in Utah. The scientists from the American Museum have known Luis for years and been in the field with this team many times. They remark often—unsolicited—how impressive Luis’ team is, how well its moving parts work, and how much fun they are, even under pressure. So though there were many strong impressions during the trip, the overriding one was the focus of the paleontologists—and the way the desert seemed to unexpectedly feed their energy. One factor was the pressure of big excavation goals coming up against a ticking clock of limited trips and budgets. There’s also the single-mindedness that comes when the cell phone doesn’t get a signal and there’s no TV for miles. But there was something else kicking around out here too, some kind of mojo, for lack of a better word, radiating out of the sage-brush dotted desert stretches that themselves, aren’t outwardly kinetic. 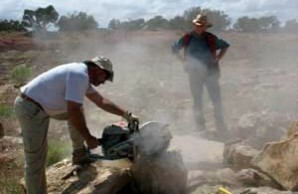 There are often a couple of separate excavations going on simultaneously during DI trips. While part of the team excavated at the Gnatalie quarry, an arm of the team worked on this sauropod tail located in a smaller quarry about 15 miles away. To avoid waxing too mystical, it might be best just to state the obvious: dinosaurs stomped around out here, rivers flooded, mountains rose up, and ancestral peoples came and went. These badlands are draped over a lot of action, and they have a coiled, contained kind of energy—you never know what they might tease out. And when the land does reveal its secrets, this team is the first to learn them. The paleontologists are couriers, basically, for the history of the planet. The DI team isn’t done with the Morrison Formation yet, not by a long shot. The future will be dictated by schedules and budgets, and what kind of equipment BLM allows the team to use. There are huge boulders sitting on parts of the quarry Luis wants access to, and the team dreams of a backhoe. If that’s not permitted, Doug will be charged with moving the boulders or breaking them apart, and he’s done it plenty of times before—shifted them with a car and wench, or rolled them with pry bars. He’s also talking about another method, untested but promising—using a heavy duty drill to bore into the rock and fill the holes with expanding concrete, which would break them into more manageable pieces. Are They Old Enough to Be Pilots? One of the kids in the cockpit warns about turbulence over the Rockies, and he’s right. He opens the curtain twice and apologizes for what he calls “a roller coaster ride you didn’t pay for.” Luis asks if I’m okay and I say I’m fine. I confess later I was absolutely terrified; he admits it was probably the worst flight he’s ever been on. The priest listened to his iPod and slept through the entire thing. The airport terminal in Cortez is the size of my office, and the chatty guy behind the rental car counter prints out some maps for us. When he asks us why we’re in town, I’m inclined to blurt out that we’re digging for dinosaurs. Luis says we’re from L.A., that we’re doing some “research” for a museum. It’s something I’ll notice again and again—the team is purposely vague about describing what they’re up to. 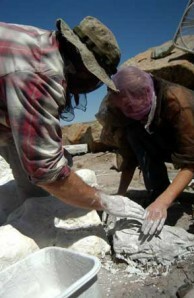 There are stories of poachers and vandals who decimate the quarries once the paleontologists have left town. The priest from the airplane—and I’m not kidding—is picked up by a nun whose habit blows in the wind when she gets out to help him pack his guitar in the back seat. Luis and I motor out of Colorado’s corner pocket and into southeastern Utah. I don’t know what I expected from the landscape out here, but I think it involved less wide open space. I grew up in Southern California, and to me, a big swath of land means a football field or a park. The pinks and the oranges of these hills are gorgeous, and the sky is oil paint blue, but I’ve never driven so long and seen so little civilization, and it takes a while for my eyes and my brain to adjust. I keep thinking that the horizons are a movie set or a backdrop in one of the Museum’s dioramas. They can’t be that endless and uninterrupted, can they? There’s a grocery store stop, the highlight of which is an enormous pork loin that Luis finds and can’t be talked out of. Later we pull off the highway because I’m convinced the headlights aren’t working, and a dog from a nearby house comes tearing out after us. I’m inclined to stop and pet it—that’s what we do in the city. Luis tells me to keep driving. It’s my first field lesson: When a dog’s running after the car, just keep driving. We check in at my motel, the Recapture Lodge in a town called Bluff. The room is simple and lovely, and five bucks less a day than my rental car. And finally, it’s onto camp. Sometimes excavation requires a soft touch. Other times, as demonstrated here by Luis Chiappe, it can involve rock saws, drills, and sledgehammers. There are hugs, and greetings in Spanish and English. The team is at 13 at this point—Paige, Stephanie, Aisling, Susan and Doug from the NHM; a geologist, an illustrator and paleontologists from the American Museum of Natural History; and paleontology colleagues from museums and universities in Spain and Argentina. The group shifts all the time however—colleagues, volunteers and donors cycle in and out as the days pass. Red wine is poured, the campfire built, and I hold a flashlight while Luis sets up his tent faster than I can print out a 10-page document at work. The ladies from the museum tell me about their auspicious arrival: the first night was so cold their hands stopped working while they were pitching camp, then they awoke to three inches of snow on the ground. Susan Russak, a Museum docent and Dino Institute volunteer, caught what she was calling “some sort of bronchitis” and repaired to a motel in Banning for a couple of nights. She’s healthy now, and back in her tent. I hear the Recapture Lodge calling me back for the night and I head to my car, serenaded by the jeers of the campers—they have no problem calling out wimpy city slickers. It’s cold and clear. I get to camp as the team is having breakfast. One of the rental car stereos is turned up with country music coming out of Durango—Taylor Swift’s “White Horse” followed by the Charlie Daniels Band’s “The Devil Went Down to Georgia.” A couple of Argentineans are brewing maté tea; the Americans are drinking coffee. It’s obvious I’m new because I trip over small rocks constantly and my jeans are clean. Except for powdered sugar from the mini-donuts I bought at the gas station this morning. We caravan first to the quarry, located off of a sign-less dirt road winding away from the highway. Whoever rides shotgun opens and closes the barbed wire cattle fence—the land is under the supervision of the Bureau of Land Management (BLM), but ranchers rent it so their cattle can graze. BLM isn’t keen on the team driving cars close to the quarry, so we park and walk about ten minutes toward some low hills. The idea that anyone would know there are dinosaurs out here is outrageous to me. Aisling picks up what I think are just a bunch of little gray rock bits—she says they’re dino bones, and that prospecting is often like following breadcrumbs. Sure enough, amid what just looks like gray rock and fine sand and boulders there’s a small pit, and in it—I actually stop in my tracks at the sight of them—in it are the greenish bones of an approximately 150 million-year-old sauropod. They’re beautiful, they really are, but start thinking about how they’re a hundred millions years old, and they also become a touchstone for concepts so weighty they induce wooziness. I ate donuts from a gas station mini-mart and listened to country music this morning—I’m not prepared to think about the enormity of time, the cycles of this planet, the total insignificance of my life, and the even scarier kicker, the total significance of my life. This sauropod, this long-necked herbivore that I keep calling “the dinosaur giraffe” to the scientists’ chagrin, is making an impression millions of years after he died. He’s connected to us. We’re all connected. We all have an impression to make and to leave. All of it matters. Oh man. I’m gonna need more donuts. Luis, Paige and I press on to the second site. It’s about a 15-minute drive away and located off yet another sign-less dirt road. It’s a different landscape here: more grays and fewer shrubs, if that’s possible, and the small dig pit is tucked under a rock overhang at the top of a hill. These bones aren’t bright green—but it’s still a dramatic sight—an articulated sauropod tail, laying right there in the gray dirt. Luis digs for a while alone, then tells the group how he wants them to proceed. We walk back down the hill to the car, and head back to first site. For the rest of the afternoon, I sit around and pretend to type on my laptop. I’m surrounded by tools, buckets, backpacks, and an ice chest full of sandwich supplies and Diet Coke, which Luis drinks constantly. More than typing, I’m listening. Sometimes the chatter is very civilized; it could be a cocktail party, except for the hammers clanking. As the hours wear on though, the paleontologists get punchy and what they call “quarry talk” sets in—impressions, songs, bad jokes, gossip and giggling riffs in Spanglish. If secrets are told in the quarry, the rule is, they stay in the quarry. When the sun tucks below the mountains, we put tarps over the pit and walk back to the car. Tonight is my first proper campfire experience of the trip. Since the work is so grueling, and since there’s nothing else going on for dozens of miles in every direction, these are lively. Tonight we celebrate Aisling’s birthday and Luis barbecues that pork loin. Wine is poured and the stories begin. These aren’t regular stories, partly because they’re true (or semi-true) and partly because the paleontologists all have honed mischievous streaks. Luis talks about a Mongolia trip where his leg became infected from a burn and his colleagues drew a line on his flesh—if the infection spread past the line, then they’d try to find a way out the country. An illustrator from the American Museum recalled a field trip in which a curator hurled a rock hammer at a yammering grad student—just missing the student’s skull, but effectively shutting him up. I hear about foot in mouth disease quarantines in Kazakhstan, disemboweled camels, and a couple of mortuary chestnuts from Doug. In addition to rough and tumble fieldwork and corpses, some of the geologists have been, or know colleagues who have been, on the payrolls of oil companies—because when they’re out in the middle of nowhere scouting rock formations, they can also scout oil. That means they are known to commiserate with government agents, and not the kind who push paper, and out of those relationships come a yet another layer of stories. I keep thinking of Switters—the hilarious swaggering CIA agent in that Tom Robbins book, “Fierce Invalids Home from Hot Climates.” There’s a lot of adventure in the world, but you have to be twisted enough to find it. Switters, and the people sitting around this campfire, are. Aisling and Susan are leaving this morning, and Susan tears up upon the “vámonos” moment as the team breaks up to the sites Luis has assigned them. Then it’s off to the spot where the team excavated Early Cretaceous footprints last year. Luis describes the find—apparently an example of the frequent intersection of serendipity and discovery, which I have heard Luis talk about before. A Dutch geologist that dropped in on the team wanted to get out of the car during a prospecting trip to look at some rocks on a bluff. The area had been bulldozed in preparation for an oil derrick, so there were huge chunks of upturned sandstone and embedded in some, ancient footprints. Luis wants to spend more time here, perhaps to find some smaller footprints. We talk about how there is dinosaur evidence under all of this land, finding it is just a question of exposure, preservation and luck. For this find, it took a Dutchman and a derrick. Paige, with a GPS setting Aisling had left her, directed us through more winding dirt roads to a spot that the crew wanted Luis to investigate. We hiked about twenty minutes into a low valley and poked around. Luis says there is too much sediment, and the bones would be too choppy. He doesn’t like it. By the time we get back to the dig site, team has already plastered some bones—they tunnel in and around a chunk of matrix, cover it in white plaster, then extract the piece. There is less quarry talk today, less riffing. Luis is antsy to get the sauropod out of the ground, and his mood dictates the vibe. There’s some discussion about the next phase, and how the team will move the boulders that cover parts of the quarry they want to dig in. This is Doug’s purview, and it’s perfect, this idea that he moves rock. Because of his size and his handlebar moustache, so he looks like a 19th century circus strongman, the ones who would lift a barbell in one hand and a girl in the other. Paige quietly announces she’s come down with “quarry wrist”—sore from hall the hammering and chiseling—but it’s not a complaint, it’s just an acknowledgment of a fieldwork rite of passage. In fact, I don’t hear anybody complain on this trip, ever. It’s almost unsettling. They get up at 7 a.m., they work incredibly hard for ten or more hours. They take one shower a week, which falls on their one day off. The campfire stories best last night’s, and I’m doubled over laughing for most of it. The team starts to stand and make their way back to their tents—and now, for the first time, I’m actually sorry I have to go back to the motel.